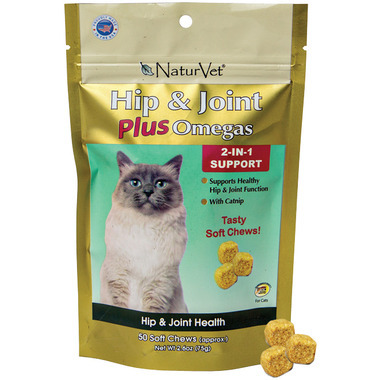 Naturvet Hip & Joint Plus Omegas Cat Soft Chews are an advanced formulation that helps support and maintain hip and joint flexibility in cats over the age of 12 weeks. These soft chews are blended with antioxidants to help fight damaging free radicals. Guaranteed Analysis (Per 2 Chews): Glucosamine HCl (Shellfish Digest)(225 mg), Methylsulfonylmethane (MSM)(125 mg), Omega 3 Fatty Acids (from Flax) (50 mg), Ascorbic Acid (Vitamin C) (50 mg), Omega 6 Fatty Acids (from Flax) (10 mg), Manganese (2 mg), and dl-Alpha Tocopheryl (Vitamin E) (30 IU). Inactive Ingredients: Brewers Yeast,Catnip, Cod Liver Oil, Flaxseed Meal, Glycerin, Lecithin, Natural Flavoring, Oat Groats, Rice Flour, Sorbic Acid, Vegetable Oil and Wheat Germ. For use in cats above the age of 12 weeks! Always follow the instructions attached to the label of this product. My cat will not eat them.